Currently, Woodwork for Inventor has post-processors for the following systems: Hops (.hop), BiesseWorks (.cix, .bpp), AlphaCAM (.dxf), CNI Informatica (.cni), AutoCAD (.dxf), TpaCAD (.tcn), EdiCAD (.tcn), IMAwop (.fmc), MasterWood (.tlf), WoodWOP (.mpr), Xilog (.xxl, .pgm), TwinCAM (.dxf), G-code 2D (.nc, .cnc, .ncd). 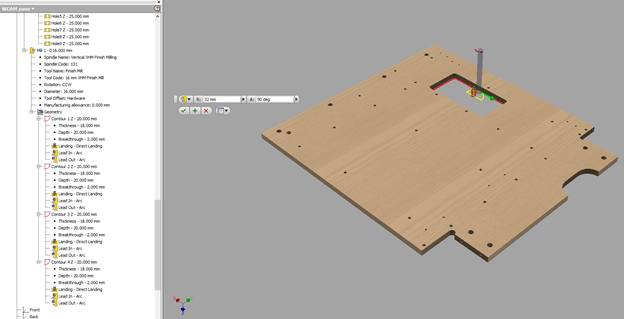 Woodwork for Inventor has an optional CAM feature. 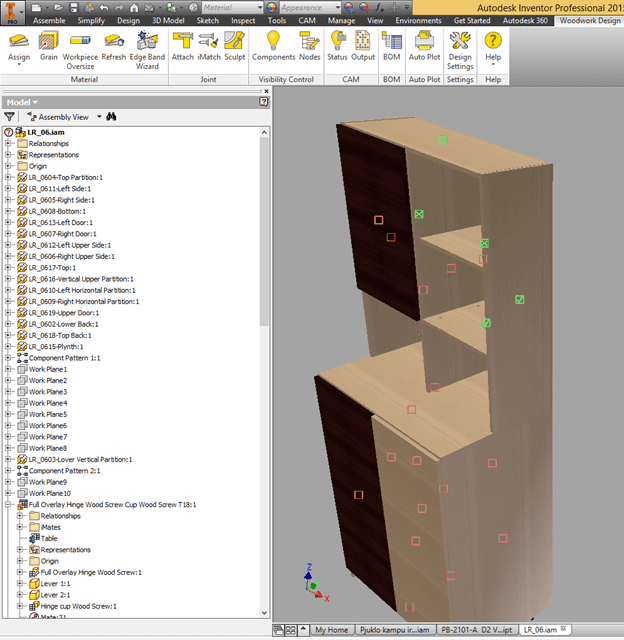 The user, after designing a furniture item in the Autodesk Inventor +Woodwork for Inventor environment, can use the model geometry directly when generating CNC programs for woodworking machine tools. The software is designed to ensure an easy and fast generation of a CNC program and to avoid potential errors to the maximum extent possible. When specifying the program base point, the user has a wide set of options to define the workpiece to be placed in the CNC machine tool. For example, it may be a workpiece that has just been cut out of the board or an edge-banded part workpiece, etc. All those selections allow you to subtly manage the nuances of CNC program preparation. Another CAM feature of Woodwork for Inventor which facilitates a significant acceleration of CNC program preparation is automatic geometry selection for creating an operation. 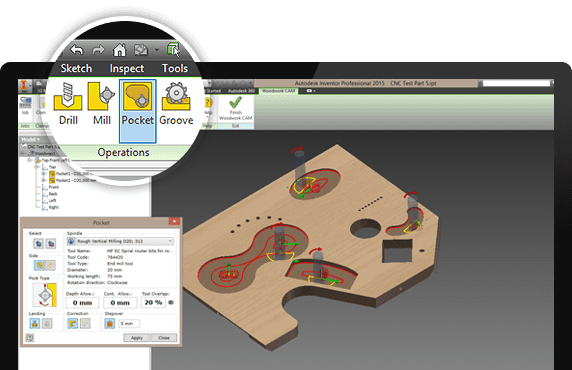 Each operation has a feature that allows you to automatically create a part geometry setup required to create a given operation. Depending on the type of operation and the machine tools spatial orientation, part geometry is analyzed and a setup of required geometry elements is created in order to create an operation. The entire geometry recognition mechanism works with the BREP geometry (boundary representation) and is independent of a parts structural component feature history. Thus, it is not important which method of hole making was used when designing the part – whether it was done through the hole generation command or using a volume extruding command or any other method of shape modification. Besides, it is possible to easily process models imported to Autodesk Inventor from other CAD systems (STEP, IGES, ACIS, AutoCAD, Solid Works, CATIA, etc.) as well. You simply need to assign a Woodwork for Inventor material for an imported model and you will be able to work with the part in the Woodwork for Inventor CAM environment. This feature facilitates acceleration of CNC program preparation and prevents potential errors. When creating Mill and Pocket contour processing operations, consideration is automatically taken of the thickness of the edge bands assigned to the part. The user can also specify the sketches drawn in the part for contour processing. For tool trajectory generation, you can indicate not only linear and curved geometry segments, but also segments represented in a spline. Created operations are represented in the sidebar and can be shown in the graphic view. The side bar contextual editing options allows you to change different aspects of how the operation works. The prepared CNC technology is generated in the form which can be supported by a tool selected at the beginning of the work. These may include MPR, FMC, DXF or any other format. 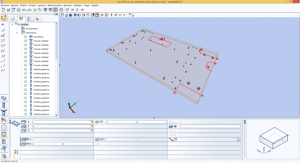 For the user’s convenience, the software offers a feature enabling the identification of parts of the assembly in the assembly view for which CNC technologies have already been created. 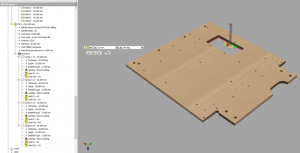 The system allows the user to select a part from the assembly view and take it directly to Woodwork for Inventor CAM environment where CNC technology is created. 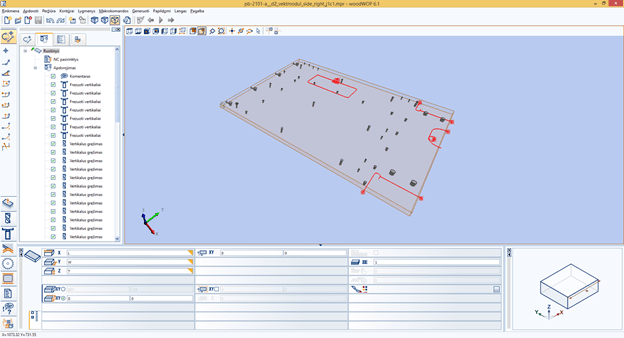 Information generation for the entire assembly allows the user to generate CNC programs in the packet mode for all assembly parts for which CNC technologies have already been prepared. 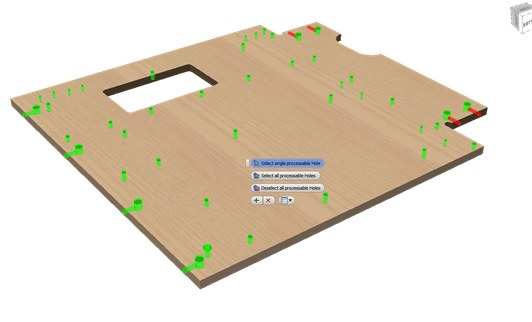 Woodwork for Inventor CAM module which has received positive reviews from users now offers a new feature – automatic technology generator. 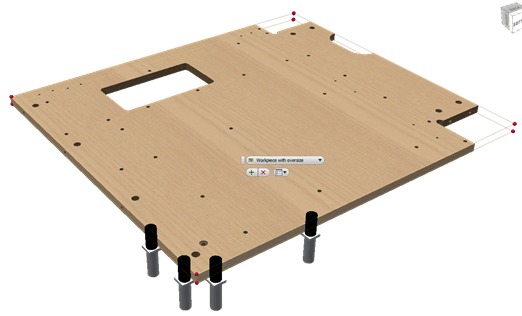 The user can now open the assembly of the created furniture item and, with the click of a button, generate all CNC programs required to process the parts of the given assembly. Moreover, you can adjust the CAM module parameters which have an impact on the content of the automatically generated technology and the sequence of operations. There also remains an option of generating CNC technologies manually and, regardless of the method of generation, these CNC technologies may be edited as usual.